The Stock Trading System for Excel is a step-by-step course on how to build a sophisticated automated stock trading model using Microsoft Excel. Microsoft's Visual Basic (VBA) language is used in conjunction with Excel's user interface, formulas, and calculation capabilities to deliver a powerful and flexible trading tool. The Stock Trading System for Excel includes five proven technical indicators (ADX, moving average crossovers, stochastics, Bollinger bands, and DMI). You are guided in a detailed fashion through creating worksheets, files, ranges, indicator formulas, control buttons, DDE/Active-X links, and code modules. After building the Stock Trading System for Excel, you simply import the data you need, run the model automatically with a click of a button, and make your trading decisions. 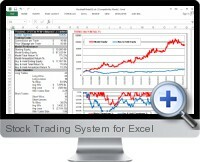 The Stock Trading System for Excel incorporates both trend-trading and swing-trading features. The swing-trading feature can be turned on or off, depending upon your investing style. The system operates with your choice of free ASCII text files available on the internet, or a subscription data service (with our without a DDE link). The Stock Trading System for Excel can be used alone or in conjunction with your existing fundamental and market analysis to improve investment timing and avoid unprofitable situations. A complete PDF Guide is provided along with a step-by-step Online Course so you can choose how to learn in the most comfortable way. A separate pre-built Back testing Model is also included for historical analysis and testing various stocks and time periods. 30 days of online access to download the materials and learn how to build and use your new Stock Trading Model. Calculate trading signals on hundreds of stocks within seconds. Step 2: Trending or Oscillating?